Plant information encyclopaedia application program for Microsoft Windows PCs and notebooks, built around a powerful but simple database. This is the original and still most frequently used edition. A single license purchase covers all 'desktop' editions, Windows, Mac and Linux. A native application for Apple Mac OSX systems. Based on the same code as the original Windows program and sharing the same features, but specifically adapted for the Mac. Work in progress - a similar adaption of the code to produce a native Plant Base program for Linux systems. Currently under development as a long term project. However, there is a fully functional Beta version. This release is known to work on a number of Linux distros and is available on request. Our mobile edition of Plant Base, an Android app that uses the same database as the desktop editions. Designed for smartphones and tablets, while still keeping the main functions of the original program. 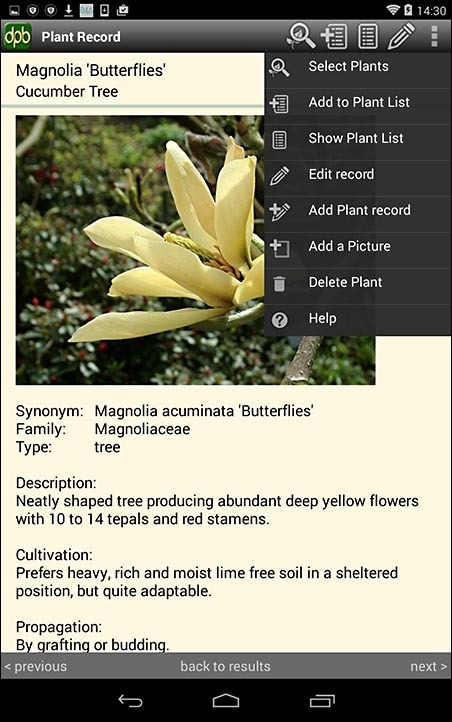 This is a self-contained application with on-board database, making the full plant encyclopeadia available anywhere. Freeware desktop tool for Windows, enabling simple entering of accented characters and other symbols that might not be on your keyboard. Easy, ultra small and very popular. An extended version is also available at a small cost, which may be of interest to more technical users. Our plant photographs, as used in the database products, are available for commercial reproduction licensing.